Posted under Health Guides. Updated 29 August 2018. “MRI” is short for Magnetic Resonance Imaging. This test is different from an x-ray because it makes a picture of your body’s organs, tissues, and bones without exposing you to radiation. 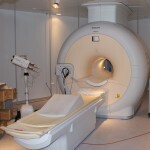 An MRI uses a powerful magnetic field and a kind of radio frequency energy that makes two and three dimensional computerized images of your organs, tissues and bones. What happens before the MRI? Before the actual test, you’ll be asked to fill out a screening questionnaire. The technician will ask if you have any metal in your body such as braces, screws or plates. You will then be asked to remove all metal objects such as jewelry, your watch, and any clothing with metal zippers or buttons. If needed, you’ll be given a hospital gown to wear. Next, you’ll be asked to lie down on a narrow bed. Once you’re comfortable, the technician will gently push the bed inside a “doughnut” shaped tube. Once in the “doughnut” shaped tube you will hear a series of loud knocking sounds. Before the test, the technician will offer you ear buds so you can listen to music or you can use headphones to block the sound (before the test). It’s very important to lie as still as possible while the machine is making the images. The technician will be close by and will guide you through the entire procedure. How long will the MRI take? The procedure usually takes about 20-90 minutes depending on the kind of information your health care provider and radiologist might be looking for. If you move, it could take longer to get the images. You may be allowed to bring your own music, or you can ask if there’s a collection of music to choose from. Listening to music will help the time go by. The MRI test itself is painless. The machine never touches your body. Sometimes it is necessary to have an injection, called “contrast” before the test. This usually is a very minor discomfort – a quick prick that doesn’t take too long. MR imaging is approved by the FDA (Federal Drug Administration) for its safety and usefulness in diagnosing many different conditions. Doctors have been using this test since 1981 with good results. However, it’s very important to let the technician know if you have any metal implants, braces on your teeth, or a cardiac pacemaker before the procedure. These objects can move or not work properly if exposed to the magnetic field. After the MRI, you’l likely be okay to go back to your daily activities, unless you had special medicine to make you drowsy during the procedure. Your health care provider will let you know if you have any restrictions on what you can or cannot do after the MRI, as well as when the results will be available.